The Turin criteria specify solid / trabecular / insular growth, lack of conventional nuclear features of papillary thyroid carcinoma and one of the following: necrosis, convoluted nuclei or increased mitotic activity (3 or more mitoses/10 HPF). 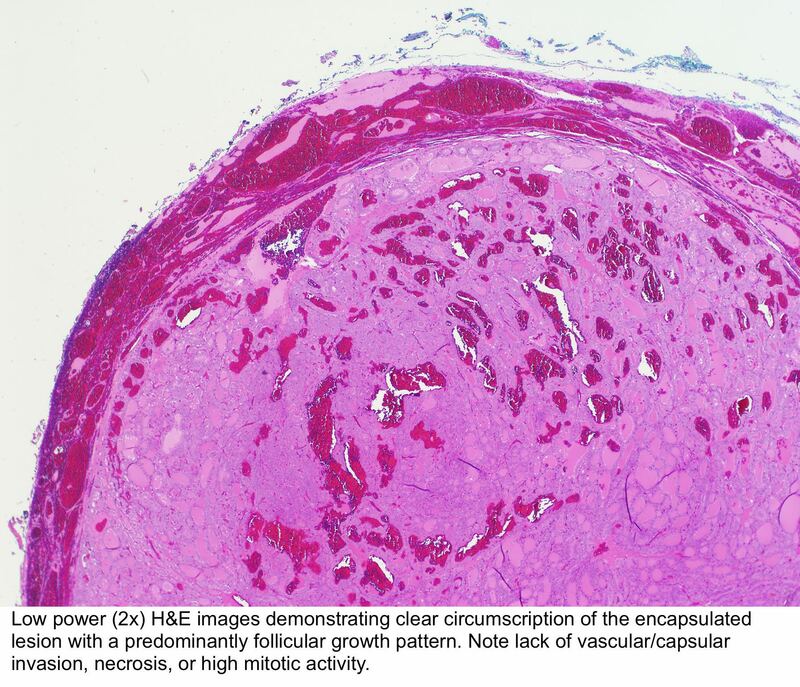 Vascular invasion may be seen in a variety of thyroid carcinomas and is an adverse prognostic factor regardless of histologic subtype or grade. Which statement is not true for oncocytic carcinoma? E. Risk factors include iodine deficiency and irradiation exposure. There are no known exogenous risk factors for developing oncocytic tumors. Which thyroid FNA cytologic appearance is classified as nondiagnostic / unsatisfactory? When the aspirated material contains only foamy histiocytes and no follicular epithelium or colloid, it is qualified as nondiagnostic / unsatisfactory. However, in some local reporting systems (e.g. Japanese), these cases are reported as "adequate, cyst fluid only" because their malignancy risk is almost the same as the benign category and lower than the nondiagnostic / unsatisfactory category. Which of the following mutations is most commonly associated with NIFTP? NIFTP shares molecular alterations similar to those seen in follicular lesions (follicular adenoma and follicular carcinoma). Which of the following features differentiates a PTC from a NIFTP? The presence of any true papillae is an exclusion criteria for making a diagnosis of NIFTP. Other exclusion criteria include capsular invasion, increased mitotic rate and tumor necrosis. Which statement is not true for medullary thyroid carcinoma (MTC)? A. Majority of medullary thyroid carcinoma (MTC) have translocation involving RET proto-oncogene is false. The majority of MTC have gain of function mutations in RET gene. MYH13-RET fusion can be found in rare RET / RAS negative MTC. RET-PTC rearrangement is found in papillary thyroid carcinoma. A. Graves disease may be associated with anti-TPO anti-bodies but it is caused by anti-thyrotropin / TSH receptor auto-antibody that mimic TSH and stimulate hormone synthesis, secretion and thyroid growth. Most commonly affects middle aged women with female to male ratio of 4:1. It is associated with HLA class II molecule HLA-DR (HLA-DRB1*08 and DRB3*0202). Which statement for thyroid follicular carcinoma is FALSE? C. Detecting RAS mutations and PAX8-PPAR gamma rearrangements can be used to distinguish follicular carcinoma from adenoma. RAS mutations and PAX8-PPAR gamma rearrangements can be found in follicular adenoma. Which histopathologic feature is not mandatory to report according to the CAP thyroid protocol? D. Perineural invasion is an optional feature to report, because its clinical significance is not well defined. D. Increased T3, T4 and decreased TSH. Dyshormonogenetic goiter is characterized by thyroid enlargement due to various hereditary defects in thyroid hormone synthesis. It is the second most common cause of congenital hypothyroidism after thyroid agenesis / dysgenesis. Family history of hypothyroidism or goiter is present in 20% of cases. Lack of circulating thyroid hormone activates TSH secretion, which causes overstimulation and hyperplasia of defective thyroid gland. There is diffuse asymmetric enlargement of thyroid gland with multinodular cut surface with absent to minimal pale colloid. Nodular and internodular thyroid parenchyma is markedly hypercellular. Nodular follicular cells are without atypia whereas internodular areas show fibrosis with single highly pleomorphic and hyperchromatic nuclei. Which microscopic feature of dyshormonogenetic goiter mimics thyroid malignancy? B. Highly atypical pleomorphic and hyperchromatic (bizarre) nuclei. Dyshormonogenetic goiter is a benign thyroid hyperplasia due to hereditary defects in thyroid hormone synthesis. It lacks malignant features common for papillary (Orphan Annie nuclei, psammoma bodies), follicular (capsular invasion) or high grade (necrosis) thyroid cancer. However, internodular tissue in dyshormonogenetic goiter often displays marked nuclear atypia with bizarre nuclei (enlarged, irregularly shaped, pleomorphic, hyperchromatic) similar to those found in radiation thyroiditis and anaplastic carcinoma. Which of the following statements is NOT true about diffuse sclerosing variant of papillary thyroid carcinoma? D. Despite being an aggressive variant of PTC with some adverse prognostic features, mortality rates are similar to those of classic PTC, with 93% disease specific survival at 10 years. How are calcium oxalate crystals useful in frozen sections from thyroid and parathyroid? Which of the following statements are NOT true of C cell hyperplasia? C cells are found along the entire longitudinal axis of the thyroid lobe. Neoplastic C cell hyperplasia can be detected in H & E stains. Patients with a thyroid mass and hypercalcinemia may have something other than MTC. Reactive and neoplastic C cell hyperplasia are biologically and morphologically distinct. RET mutation distinguishes neoplastic from reactive C cell hyperplasia. A. C cells are NOT found along the entire longitudinal axis of the thyroid lobe, since only the upper two thirds of the thyroid lobes are populated by C cells. What risk of malignancy is associated with benign thyroid cytology? A. 0 - 3% Most published studies reported that a benign FNA diagnosis is associated with a very low false negative rate, estimated to be in the range of 0 - 3%. It should be noted that the precise risk of malignancy for cytologically benign nodules is difficult to assess because only a minority of these patients undergo surgery. Which of the following features are not found in anaplastic thyroid carcinoma? D. PAX8+, thyroglobulin+, TTF1+. Anaplastic thyroid carcinoma can be PAX8+ in more than 50% cases; however, this tumor is generally negative for thyroglobulin and TTF1. 50 year old woman presented with widely invasive follicular thyroid carcinoma penetrating thyroid capsule and strap muscles (confirmed on thyroidectomy) and spinal metastasis (confirmed by imaging and biopsy). What is the clinical stage as per the AJCC / TNM 8th edition? B. Stage II. Despite the advanced disease, this patient is qualified as having stage II because her age is less than 55 years. Age at presentation is a critical prognostic characteristic in well differentiated thyroid carcinoma. Histopathological examination of total thyroidectomy specimen revealed conventional papillary thyroid carcinoma in the right lobe (1.8 cm), with minimal extrathyroidal extension (perithyroidal fat), microscopically involved posterior resection margin and micrometastasis in the single perithyroidal lymph node (0.2 cm). What are the correct pT and pN categories? C. pT1bN1a. T1b describes a tumor > 1 cm but ≤ 2 cm in greatest dimension limited to the thyroid. Minimal extrathyroidal extension was removed from the definition of T3 disease in the AJCC / TNM 8th edition and therefore has no impact on T category. Metastasis to the central lymph nodes qualifies as N1a. Which cytologic appearance of thyroid FNA specimen is classified as adequate? When the aspirated material contains only abundant thick colloid and no follicular epithelium, it is qualified as adequate. Colloid may have variable appearance. It is important to recognize a substance as a colloid, not blood. 3 groups with 10 benign follicular cells are not sufficient to be qualified as diagnostic per the current criteria. 59 year old man presented with a 2 cm malignant pleural tumor with involvement of contralateral lung parenchyma. Biopsy revealed well differentiated epithelioid malignant pleural mesothelioma confirmed by BAP1 immunostaining. What is a clinical stage using the AJCC / TNM 8th edition?